Do you work for angularjs? Learning about angularjs? We can help. "Soy un gran admirador, pero sus días están contados"
Parece que estamos en la parada de la existencia natural de Angular 1.X. Si no lo sabes ya, es difícil de recomendar. Es una biblioteca excelente, pero vienen asuntos extra. Dicho esto, Angular 1.X necesita vivir indefinidamente. Hay una TONELADA de aplicaciones dentro de la naturaleza usándola mientras hablamos. Necesita ser admitido en el futuro y sigue siendo una pieza impresionante de programa de software, en mi opinión. Rápido desarrollo de aplicaciones web y creación de prototipos ... Y realmente disfruta de estilos de vida como desarrollador de aplicaciones web. Ambos objetivos se habían descubierto completamente en el curso de nuestra transición de un gadget spine.Js. One of the most confusing things I have found working with angular is the chosen nomenclature for things. Most of the concepts that are handled with angular are familiar concepts that I already knew, but the way to call them is a bit strange. The learning curve is a bit harsh, especially due to the lack of documentation and the choice of names, but then it is quite productive thanks to things like databinding and the control investment container. "Worth the try if you are building Single Page Web application"
Although there are many updates to Angular like angular 2,4,5,6 etc. Angular JS had its sweet spot among the top when it was released. 2. Watching changes in a specific scope object and based on the event perform actions. 3. Each section can have its own controller and independently controlled. 4. Very lightweight and built in support for multiple languages, culture. 5. Easy to integrate in existing applications. It was perfect in everyway. But when typescript evolved. It lacked few points. 1. Lack of object oriented programming support. 2. No type safe mechanism. 3. Not easy to maintain compared to angular 2+ applications. As angular is regularly updated and you should move on to much simpler and object oriented programming platform Angular 2+. It solved the hardships to create a Single page application. It made the application run must faster and smoothly as there no more requests to server for getting pages. "The best JS framework and the best UI management language." 1. AngularJs is better then any other language to make develop one page application. It will reduce your code so you can develop same website in less file size. easy to use and easy to install with all the services. 2. AngularJs will make your UI part so clean and clear which helps developer to make their code so readable and usable. 3. AngularJs is best to make your website more dynamic . So by the change only in one place it will reflect to hole website. 1.Till now i did not found any thing to dislike AngularJs. 1. I am developer and I used it to develop the websites for our clients. 2. The best thing it save our time and file size and make our code more readable and usable. There isn't much to dislike. it had a steep learning curve. was fairly simple we have since just stuck with it. i definitely recommend AngularJS it works great. the creation of front end UI for both websites and multiplatform applications via electron js. the java script nature of angular makes it easy to put a project together. "Useful framework for creating a Single Page Application"
Worth looking into, but be prepared for a learning curve. However I think it is worth the time but in as there is a lot of good features available in AngularJS. The initial tutorial on the AngularJs website is worth following. 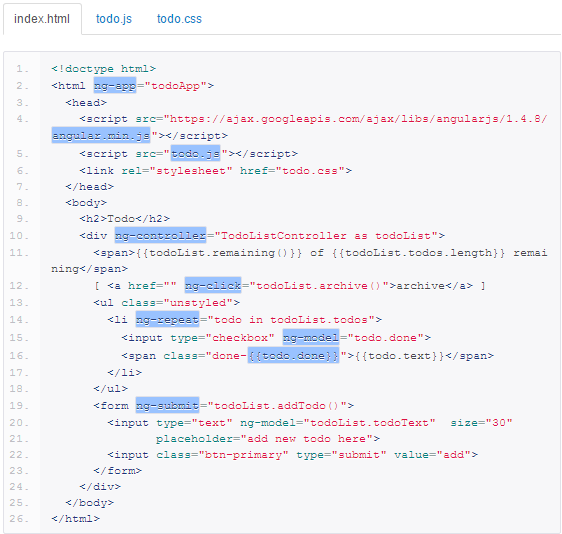 "Angularjs 1.x goods and bads"
- testing! angular team emphasized the importance of testing (unit, e2e) like no other framework before. Docs are full of testing examples. AngularJS 1.x is a good choice for small and mid sized projects. There is lots of UI components and\ or services integration libs out there, which will help you kick off the project fast. 1. performance, if you will use it inside Mobile Application, you should re consider the performance - Native Angular UI components will behave sluggish in mobile. 2. Learning curve, if you aren't already familiar with Angularjs - it will take months to master all out of Angular. It seems fast at first and things get to work quickly, but after sometime you will discover that you did it bad way which may decrease performance and you will do some rework. The filters you can use on objects make it really easy to filter data without doing other AJAX call. You set a scope really easy and also the ajax calls are very easy to use. You can create advanced filters and apply them directly to the HTML. "AngularJS is a great framework for web apps"
The community of developers around AngularJS is amazing, there are a lot of answers, content, tutorials, guides, styles, and information that can be used to make sure you're using AngularJS the proper way, and help you create apps in an effective way. The fragmentation between AngularJS and Angular can be confusing, some of the tooling can improve, and it can be easy to make mistakes that affect performance. Start using Angular 1.6 with the upgrade in mind. I think is too early to jump in Angular 2. Make everything a component, use an isolated scope, think reusability, think twice before adding plugins or libraries from others. Keep making performance measures. Add tests from the beginning. I've used it to create enterprise applications, with lots of components, moving parts, requesting data from an API; to manage hundreds of thousand of customer's data. AngularJS is extremely easy, is fast to start a new application and powerful enough to create a huge application. I can't omit a important feature, is totally open source. Created and maintained by community, the documentation is diverse. I don't know why but the market share of AngularJS is not great yet, this is not great because fewer projects is able to hiring people with this skills. Doesn't seems there is a strategy about enhance the market share %, because the AngularJS 2.0 is been released to compete the share with the "Angular 1.0", It's strange strategy to me. Angular is a great framework, my recommendation is to study each case that Angular.JS offer before start develop, is easy to use but you can spend resources unnecessarily. Start simple but stills get improved in this technology. I'm developing web and windows applications to intelligent system of urban mobility, couple months ago we developing our first project using AngularJS, but we doesn't using SPA in this website to students make your own revalidation to system. Testing AngularJS with a little more experience now, we think that use a SPA approach was the best scenario. "AngularJS is a Great Front-End Framework"
Well even though the extensibility of AngularJS is a huge selling point it also means that out of the box AngularJS can be a bit bland. Once you start to become a competent web developer you are start wanting your web framework to already have livereload built into it. Further, the question of which sever or database to use comes up very quickly in the AngularJS developers career, and few strong choices are there besides switch to a full MEAN stack. Start learning it right away! Also start practicing Angular2 which comes out soon. Don't get bogged down with needed a backend and a datastore, you can still build beautiful static websites with it. We use AngularJS to build web apps for our clients. These can be large video projections, interact social media campaigns, or touch-screens embedded at points around a city. Angular has made it easy to rapidly prototype the Front-End for new projects. It has allowed us to work much much faster without sacrificing any content. "The web as it was meant to be." Ease of use of two way data binding: You setup your data in your controller, tell the template to use that data, and data is synchronized between the user interface, and the data model. Its modular design allows creating multiple components in multiple files, so to make the application more manageable than ever. Its components still to not use shadow DOM (that Polymer uses) so CSS cannot be embedded inside templates, and they can interfere with each other if the developer does not care enough. Separating development of front end, and back end of web applications so to have separate development repositories, and test cases is of paramount importance. Furthermore the model-view-controller pattern allows modules to be developed, and tested, separately. It eases managing separation of concerns. "Structured client development with AngularJS"
Clear and concise structuring because of the way that controllers, services and alike are implemented. Once you get your head around development with AngularJS structuring your application is very nice. Using additional generators like Yeoman (http://fountainjs.io is my favorite) and the immense community - providing tutorials, information and many libraries and components - make the experience very fast and painless. Until it finally became clear that AngularJS tolerates jQuery but that the best results are made when you drop the jQuery usage entirely it was quite a struggle sometimes to get implementations working. Now I know you should use Angular for mutations and interaction implementing and not a combi with jQuery. AngularJS is nice. I'm still learning to work with Angular2 and think that component based development has outgrown MVC setups so there lies the actual future. But the community and resources available for AngularJS still make it a valid framework for nowadays. I've developed websites and mobile (hybrid) apps using AngularJS and once you have selected the right tools (gulp, yeoman FountainJS, ionic framework, etc) and get a nice workflow going the development time gets smaller and the coding amount increases project after project. Although there are some tricks required for certain situations, once you get the hang of it, you can create a robust application rapidly. From version 1.5, you can apply flux like data flow architecture with one way binding. With complex pages (e.x. many form inputs), the two way binding and digest cycle (the change detection architecture for AngularJS) will significantly slow down the performance. For now, there are only hackish ways to avoid these problems and are pretty difficult for novice developers. Furthermore, the built in router and REST API service won't satisfy your needs most of the time and you will tend to replace it with other services (e.x. ui-router, Restangular). AngularJS has a very large community and many robust libraries. Angular2 has been released so it is difficult to decide which to use. But from AngularJS 1.5, you can create AngularJS apps in a design like Angular2. And it is said that you can gradually convert the code base to Angular2. So it is still a good decision to choose AngularJS. I've created many enterprise applications with AngularJS. Mostly converting manual workflow (e.x. using Excel) to web service workflow. "One of the best client side web frameworks"
If you design a application for different platform angularJS is one of the best frameworks for the client side. you just need to design web services and then you can easily create an interactive and fast web site. I also like the size compare previous works. At first it's fairly complicated to start because of different component, but when you learned the basic it's become easily, I also didn't like some of keyworks and syntaxes I think they can have better structures. In general the most annoying part was beginning using it. If you are using a old client side framework I really recommend considering the angular. We have two project we solve with AngularJS first one was an electronic market that we need to have both mobile applications and web site we used angular to build the web site part we used it on top of django. the other project was among 10 people which was our first project we choose Angular because we wanted to lean it. the project was a crowdsourcing platform. 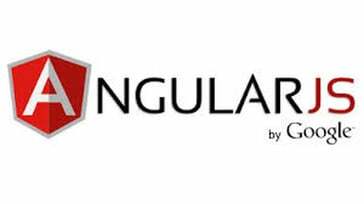 "AngularJS as frontend development tool"
The best of AngularJS is that it offers a complete development environment for big SPA (Single page apps). So, only using angular you have a consistent and well-structured environment that helps you to build big sites based on several components like Modules, Services, Factories, Directives etc. Each component have its own function and this guide you in the development process, which allows you to develop organized web-apps. The same that helps you to build organized web-apps cause that these apps become "fat apps", with a lot of dependencies. In the other hand, the digest cycle of Angular makes it a big CPU consumer. In this time, when AngularJS 2 is raising and ReactJS it's over the table, I recommend to take a look directly on these tools instead of AngularJS. Information systems. The main benefits for apps of this kind, are the structure. Modules, services and reusable directives helps you to organize big web-apps. "I'm a big fan, but its days are numbered"
* Nearly impossible to track `$digest` errors in production. Oh my goodness, it's a nightmare. It feels like we're at the end of Angular 1.x natural life. If you don't know it already, it's hard to recommend. It's a great library, but greater things are coming. That said, Angular 1.x must live on indefinitely. There are a TON of apps out in the wild using it as we speak. It must be supported well into the future and is still a formidable piece of software, in my opinion. Rapid webapp development and prototyping...And actually enjoying life as a webapp dev. Both goals have been fully realized during our transition from a backbone.js system. "Elegant client side web development framework"
Its separation of concerns as well as its mindset for organizing a code, separating it into Services, Controllers, Directives and Filters. It makes developing a web system a lot easier and intuitive to assemble. Sometimes when something goes wrong with the code, everything breaks and there's not a whole lot of ways to find what's wrong, one has to go along with one's intuition and experience. They sure have added a lot of feedback when one forgets, for instance, to add a dependency injection, the error rendered at the browser's console provides a link whereby one can access AngularJS documentation, which is neat. Ease of implementing. Strong community, lots and lots of documentation, tutorials, great books and other materials to learn. It's a famous framework, so I'm sure that you won't find any problems with trying to get help whenever the need of clarification arises. Deciding what to use in order to build the client side for a web system is not the easiest thing in the world. I needed a fast framework whereby I could apply the best possible Lean programming style. "The start of true Web Apps"
Angular is super easy to use, incredibly fast and integrates nicely with everything. I started developing interactive web apps with jQuery but after finding about AngularJS I never went back. It allows me to do my job so much faster than I usually would. Angular is great but sometimes it can be a bit buggy. I had two big issues while developing with it and it took me a while to understand what was going on. It also lacks a bit of organization as you can pretty much code everywhere. This was improved in AngularJS 2. It is hard to complain about angularjs as it does the job and the performance is incredible. If you are building a small prototype or webapp, go with angularjs. If you want something more robust and organized, go with angularjs 2. Always search for your issue, angularjs has a huge community support and you will not get disappointed. I've been developing hybrid apps and also web apps with angularjs. For interactive web apps there is no better tool than angular. It integrates so easily on any application and works so well out of the box. Lately I've been using angularjs to build prototypes for services and it is not letting me down. Amazing product. "I've used AngularJS the last couple months for SPAs, not going to look back"
The simple fact it makes coding Single Page Applications (websites) it's just enough to make it a very versatile and needed tool in every developers toolbox. Also, being able to have MVC (Model-View-Controller) paradigm to build up from the ground your own stuff is another good reason to consider this framework as a go-to when starting a new web application. Debugging AngularJS code can be a REAL pain, as it doesn't always triggers red flags when something major is going on. Scope inheritance can be another major issue if you don't code in a proper way, leaving you without that JS feel of "freedom" we always get. You better have some prior JS experience when trying this one, it can get a little tricky with those directives yet you can get use to them fairly quick and get your job done in no time. Coding a webapp from scratch can take you up to 20 mins, a sketch, a prototype, yet a fully functional one, which is a great improvement in your development workflow. "MVC development in Front-end "
I like they way of how angular can be used to structure all the front-end development using an MVC pattern in a very fancy way. Controllers, directives, routes, services and data binding are awesome and very useful to organize any project following the MVC pattern; you can create SPA in short time with minimum effort. It's easy to learn, once you have used it you will love it. Angular is easy to learn and use, when you need to access the DOM angular offers a nice approach with built in directives, you can also create your own custom directives, directives are nice but, in many cases using directives to manipulate the dom is not so easy as we expect, I think because angular is more focus on data binding instead of DOM manipulations. Angular is easy to learn, very well documented and is used in many companies around the world. It helps to create very rich web apps in less time that you would expect. Powerful framework, with simple templating and two-way data binding. Performance seems good, works well cross-platform, and has great backwards compatibility for older browsers. A lot of things are changing in version 2, which will require massive refactoring to upgrade. You have to take the good with the bad in the name of progress. This is the best framework I've used for front-end development. Others seem to try and do too much, or not enough. AngularJS has a good balance between flexibility and ease of use. It is pretty well adopted by this point, so there is a good user base for support. Separation of display and business logic, reusability of components, rapid development and prototyping. "Unfortunately the best solution out there for MVCs"
I like that there is a large ecosystem of Angular plugins and there is a lot of community driven documentation available (a la Stack Overflow). It's the little things about Angular that will drive you insane. Often no error messages will show up when things aren't working right. When the error messages do show up, they're often very unhelpful and there is no semblance of a callstack or much that would show you where the issue lies. Performance is also not the greatest. Angular has a reputation for doing a lot of polling for changes instead of being able to just hook in and listen. If you're putting hundreds of items in the scope, the browser will lag. Angular requires users to manage aspects for performance that you otherwise wouldn't think of having to manage. "The power for the need"
Its ability to inject data with a format that remains easy to interpret for designers is nice to keep all in the loop. It does get a bit cumbersome for getting the project ready and is rather opinionated which tends to silo a team into a single framework mentality. Take the time to learn and come up to speed with it. It can be a bit heavy handed in some places, but it is growing and makes sense in a number of places. We have used Angular for creating a way to communicate live between platform and server and keep things fresh. The biggest benefit we have was the ability to match the front end development to live mockups mostly intact. "Angular was the best framework for beginner but not anymore." the simplicity when starting a project, you can start hacking right away at the beginning. Now it's not so simple to start with an idea in mind there is a lot of thing to do before you can start to do some logic from your app. If you miss the simplicity of angular 1.x its better now to take a look at something like Vue.js the entry level is lower and you really can start to hack right away. adding reactivity to my websites and web apps, it was simple and really isolated from the rest of the stuff i do on the server side. "Easy for small projects. Architecture and communication channels need to be thought for big projects"
Modules - key to build and separate you app in modules based on responsibilities. Dependency injection - Make easy to retrieve services from other modules to perform some logic. Directives - move web app towards a more component base app. Interceptors - intercept errors globally or by ajax call before the error is thrown. Transformers - catch ajax responses and transform responses on your wild (specially helpful when json response has a non-logic form and you want to work with a different json structure). Official website - provides enough documentation for making easy web apps and basic understanding but some topics can be difficult to find or difficult to understand in the way they are explain. Communication channels between directives - while there are multiple solutions for managing the communication between directives (shared-service, share-scope, arguments to directives, broadcast & emit) all of them have drawbacks that attack maintainability or reusability. Prototype chain and double binding - Some issues will appear when you work with primitive values due to prototype chain. Weight of AngularJs - For building big web applications you will find yourself adding a bunch of modules not included into the AngularJs module. You will need to include then apart. Easy but you app will grow in Kb. Build mechanism for releasing to production asap. Not done at the beginning can bring issues when you have +100 files and you decide that now it's the time to make some process to build production release app. Test design approach will help you not just for testing but also in modularizing the app. Not started at the beginning can make testing more complicated when functions are not exposed. It will allow you to reuse functions that you now they have been already tested. "A good framework for scaffolding your front-end application"
Poor pre-rendering support and no universal app resulting in poor SEO of the existing project. I had to move all of my existing projects from angularjs because of the no backward compatibility with the Angular.IO. All the libraries used are not maintained anymore and I was maintaining multiple libraries myself.
" Superb tool but steep learning curve"
Two way data binding, definitely. How could people survive without it? .But besides that angular is very expressive, you don't need to write much code to get good results, making it a great tool for prototyping. You can get your idea up and running in no time. All said above is great once you know angular. Since it introduces some new concepts it is very different from other js libraries out there, so the learning curve is quite steep. It is easy to learn the very basics, but the more advanced features are quite tricky. Other dislikes is that if you have too many variables in your scope the performance starts to go down. I also find the controllers a bit "messy": even if your app has kind of independent pages (components), everything still seems to be altogether in the source code. Fortunately angular2 is here to solve most of the problems with angular1. If you are starting with js now (2016), I suggest you to take a look at angular2: many improvements over v1. Also for who is starting: don't give up, it is hard in the beginning but at some point it just clicks and everything starts making sense. I used angular1 to build a niche app (both hybrid and webapp) for an institution. It works fine for the almost 10k users. "Version 1 is dated, Version 2 isn't yet ready"
The learning curve was pretty high, the documentation sometimes not great, and it didn't interact very well with jquery modules. Slowed down loading time on websites. Single page apps are not very SEO friendly. Anything updated outside an angular digest cycle is completely missed, and workarounds are lengthy and timeconsuming. Wait until Angular 2 is stable, then see if there are any real contenders. So far, they continue to put out breaking changes, and the documentation isn't really keeping up. 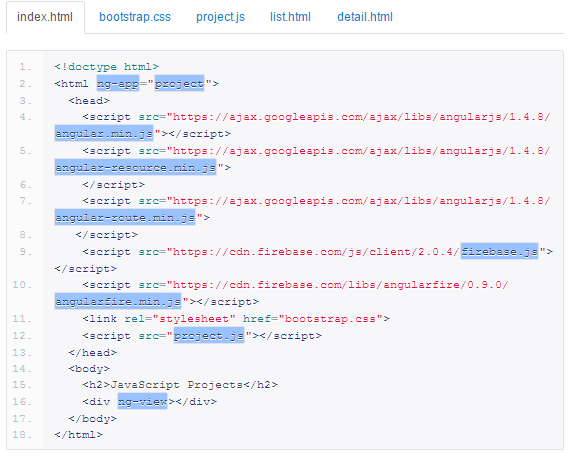 AngularJs allowed for really dynamic content, and there were a lot of angular versions of things that angular didn't interact well with - bootstrap, jquery. "SIngle page and MVC framework for web application development "
I like structure and configuration of MVC design pattern. It reminds of other languages for front-end development such as Java JSP/JSTL page development. 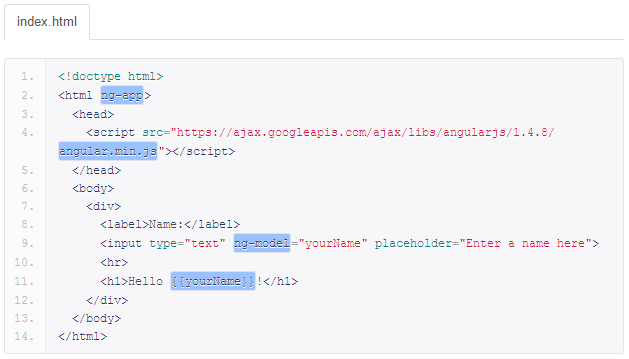 I have been able to extend and customize the HTML using Angularjs's directives and services. I have been able to focus to develop the logic controller part for each page and use it as often as possible in a large enterprise project. Building Responsive web applications for my customers. I like that AngularJS has a number of prebuilt solutions to plug into HTML and CSS for enabling websites to behave in desired ways. In many cases, different websites will have similar behavior and AngularJS as a framework supports many of these behaviors out-of-the-box. Once one has mastered a few basic concepts - directives and controllers, in a nutshell - AngularJS opens a world of front-end goodies. "Solid, productive framework starting to show it's age (1.x)"
Angular's biggest benefit for our team was in providing an intelligent way to provide structure around application logic. Got a page for tracking incoming sales? Separate logic out into TransactionController + TransactionService, with directives for shared components. It has also been around long enough that it has an excellent community with well-maintained modules, making it easy to get productive right out of the box. We still use Angular for internal projects, but the learning curve in more advanced use cases (understanding the complexities of the digest cycle, setting up a $watch, $scope.$apply(), the difference between 'link' and 'compile' functions in directives, etc) has led us to adopt React for customer-facing projects. I wouldn't recommend Angular 1.x over React for new projects for most teams, although it continues to be an excellent and well-maintained framework. Angular 2.x is a completely different beast, and a step in the right direction, but I haven't had the opportunity to work with it at scale. Our use of Angular has been restricted to our internal CMS for managing sales, customer relations, and other business interests. As an internal-facing product, it's often been subject to frequent requests to tweak this or that, add small features here and there, etc; and the architectural structure Angular encourages (when used right) have allowed us to implement those requests quickly and relatively painlessly. The idea of structure that angular provides is fantastic. Is allow you to maintain scale able code efficiently with out TOO much overhead. It forces you into some best practices that most people should be using anyway. Did I mention the community? It is very opinionated. While it is very powerful, it makes you follow their own design and rules without allowing you to customize the framework as much as others like Backbone, It is easy to pick up and throw an app together, but it is very difficult to get wrapped around some of the more robust features that it provides. If you are looking at Angular just to be on the bleeding edge that go for it. It is definitely in the forefront. If you are looking for a stable platform to build an application out of, prepare for a large learning curve. It it very steep once you begin to get into the real heavy features,. . The main problem I tried to solve using Angular was creating an app that was reusable. I thought it would work great for that purpose because it has a large community as well as a defined structure to follow. The problem i ran into was the implementation. It takes a significant investment of time to learn and actually implement the framework. It is easy to make something extremely basic but once you begin to make something that is more toward the production level it takes a lot of time to learn. "Few lines of code, lots of support"
Debugging is hard for newbies, especially when we put code in the wrong order, forget to include a module in the declaration of a module, make syntax errors. "A lot of work that might have to migrate with angular 2"
You need to learn a lot to really use it, it's very simple in the first steps but you have a steep learning curve for learning directives and digest cicle and other concepts. The works thing now is that I have to learn again angular 2 since it's a different framework, it seems similar in some parts but has changed and when you finally think that you are set with a framework one must learn something again. * A wide array of plugins to help build awesome products. * Industry wide use and backing of solid firms. * Great documentation to help beginners. * Steep learning curve - Getting started with Angular is easy, but learning some of the advanced features can make you pull your hair. If you're starting right now, look into latest Angular 2. Although, earlier versions are still used all over industry and would need constant support. * Easy to build MVP. "Robust and easy to use"
It's easy to learn and start implementing a project. With AngularJS you can save a lot of time on common development things that other popular libraries doesn't have a good support. The code looks weird when you have to inject many dependencies. The function declaration of the controller looks messy when it happens. But if you follow the best practices you can avoid such of things. Stay in touch with the community. There are good articles and books. Follow the best practices. I've developed a huge customers management system in a very short time. Using directives makes you very productive and it will save you a lot of time by reusing code. It is far more easy to create good applications with frameworks like angularjs that with jquery. Some concepts are difficult at the beginning: differences between services and factories for example. It is not very easy to use at the beginning. But I think they addressed all of this with the second version. "Flexible JS MVW Framework with DI"
"Highly performant, easy to use UI Framework"
MVC way of the framework. The structure of the project is flexible and easy to understand. Sometimes there could be bugs and code could be messy if you dont follow the conventions. Start with AngularJS 2, because thats what will replace the current Angular version, also it has some ES6 functionality. Building UI for approximately 4k people with a big data shown on the UI, which requires a lot of processing. Angular deals with it pretty good. "A good MVC solution for Web"
The community is very large and there is a lot of documentation. It's very easy to use and to learn. Controllers, directives, routes, services and data binding are awesome and very useful to organize your project. The error message system is not one of the best in the industry. There are some mobile device bugs. You better have some prior JS experience when trying AngularJS and some experience with MVC pattern. It helps to create very rich web apps in less time that you would expect. Coding a webapp from scratch can take you up to 20 mins! It could be a great improvement in your development workflow.